Lets start out with the music video. This is by a veteran k-pop star, who was once in TVXQ. He sued SM Entertainment to leave the group along with three other members. This band used to be as big as Big Bang, or bigger. I admit the video confused me at first. If you watch it you will understand why. Have you watched the video so you can have an idea of my confusion before I uncover what reading the comments lead me to uncover? In reply to this comment is another that show the contempt many K-pop fans have for SM Entertainment. You might think this is a dramatic way to view SM Entertainment unless you know what they do to artists who leave their company, like the singer in this video Junsu. After he and the two other artists left SM Entertainment he formed the group JYJ. SM Entertainment uses underhanded methods to keep them from being able to promote. So this once King of K-pop only has 2,519,205 views months after releasing this epic video. To put this in perspective Got7 reached that amount on Just Right after only about one day. It is so bad that an assemblywoman proposed the JYJ Law. Here is an article about it on Soompi (“JYJ Law” Proposed to Prevent Unreasonable Blacklisting of Stars) The law, however, failed to pass. Now if a SM-stan read this post they might be offended, but SM Entertainment’s record speaks for itself. I was so hurt by their mistreatment of artists that I went from an SM-stan to other companies. I am sure I am not the only one. However, I do not see this video as being about SM. Recall TVXQ’s promotion period is now called one of the Golden Ages of K-pop. This was the Second Generation of K-pop with artists like Wonder Girls and 2pm. Yet, now the Third Generation is coming up. Here is an article about this Third Generation on kpopstarz (Comparing The 3rd Generation Boy Band Debuts Of ‘The Big 3). 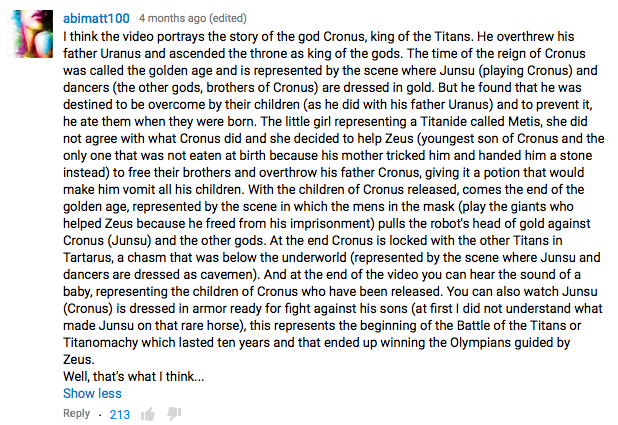 This music video is about how the 2nd Generation (Cronus) of K-pop defeated the 1st (Uranus) and was defeated by the 3rd Generation (Zeus). It has nothing to do with SM, but the whole Industry. It is about the end of an Era in K-pop. I just had to note the SM comment, because it is a big part of K-pop. Hopefully SM Entertainment will start treating its artists better in the future. If K-pop fans do not express their discontentment with the treatment it may never change. I will comment my conclusion on the Youtube music video soon.